"An awesome change from cheesy fondue sauces! 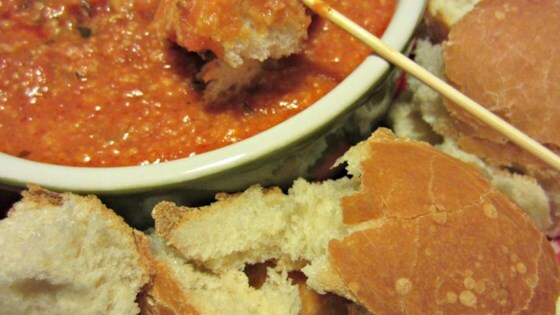 This pizza fondue is great for both kids and adults." Stir spaghetti sauce, mozzarella cheese, Parmesan cheese, oregano, dried onion, and garlic salt together in a fondue pot or heavy pan. Light the fondue pot or place over medium heat, stirring sauce to melt cheeses. Serve with cubes of French bread for dipping. This easy party dip is creamy, smoky and perfect for a crowd of foodies. I used pizza sauce like the others, and dipped pepperoni and veggies. The kids loved it! We added a slice of pepperoni with the bread just because....and it was awesome!